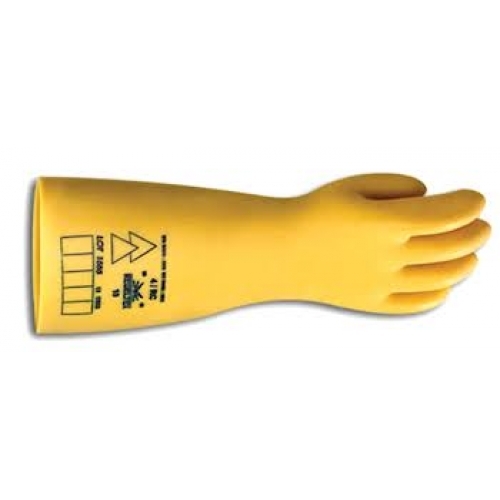 Likewise, our production is subjected to a system for ensuring EC quality of production by means of monitoring to implement article 11b of the 89/686/EEC directive relating to Personal Protective Equipment which classifies insulating gloves for live working in category III (mortal risks). ln the choice of class, it is important to define the network nominal voltage which must not exceed the maximum operating voltage. For multiphase networks, the network nominal voltage is the voltage between phases. 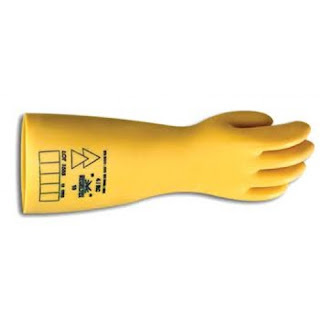 The test voltage is the one applied to gloves during the individual routine tests. The withstand voltage is the one applied during the validation tests after the gloves have been conditioned for 16 hours in water and after a 3-minutes test at the proof voltage. The elongation at break values must be at least equal to 80% of those of non conditioned gloves. The tension set must not exceed 15%. The gloves must pass the proof test voltage. conditioning of gloves for 1 hour at -25 ± 3°C. The tests are satisfactory if no tearing, breaking or cracking after folding is visible on the cuff and if the gloves pass the proof test voltage. Application of a flame for 10 seconds at a finger tip. The test is satisfactory if, after 55 seconds, the flame has not reached the marker located 55mm away at the other end. • The tensile strength and elongation at break values must be at least equal to 75% of those of non-conditioned gloves. • The gloves must pass the proof test voltage. • The tensile strength and elongation at break values must be at least equal to 50% of those of non-conditioned gloves. The tests are satisfactory if no tearing, breaking or cracking after folding is visible on the cuff and if the gloves pass the proof test voltage. Each pair of gloves is packaged in a different coloured opaque sachet depending on its class of protection. The following information is given on the packaging : class, size, categories, type of cuff, length, test date, manufacture batch number and validation batch number.